Before we left on our Disney Cruise for Spring Break I created a few Personalized Disney Family shirts. 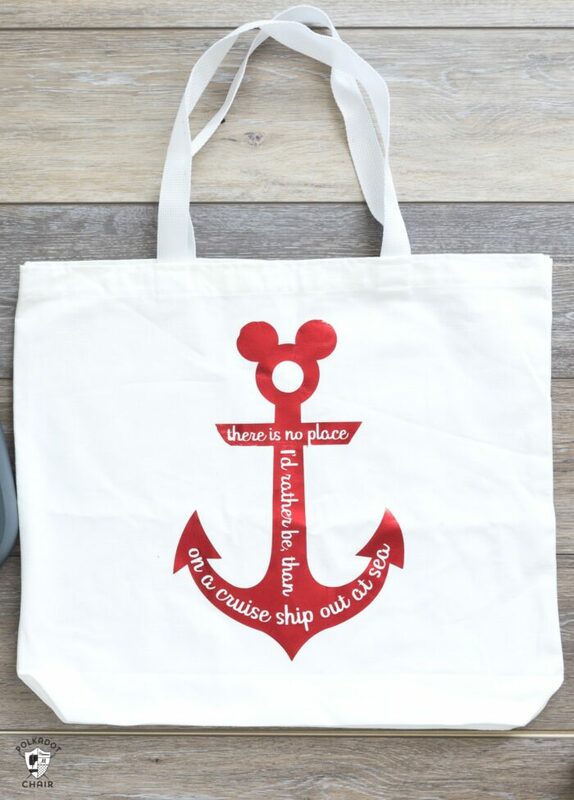 I even made a fun Disney inspired beach bag to tote around the boat with me. I had so much fun making the custom Disney SVG files for my projects that I thought today I’d share the files with you! 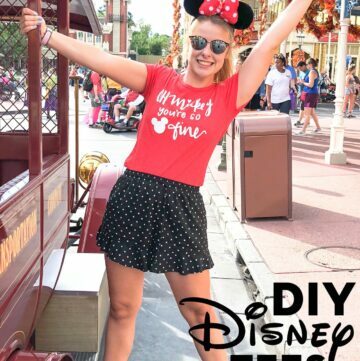 I’ll walk you step by step through how I made the shirts and share a few Disney shirt ideas just for cruising with you! This post contains affiliate links. Before we go on family vacations, I like to take a bit of time and create a few fun projects to take with us on the trip. To me, it’s a way to make the joy of a family vacation last a little bit longer since I get the fun of creating the projects before we go! A few years ago we took a different Disney Cruise and I had a whole slew of projects planned to make before we left. We had a minor hiccup (basement sewage backup YUCK) and none of them got done. We were actually lucky to even make it to the boat on time that year! This year, I tried to plan ahead a bit more. 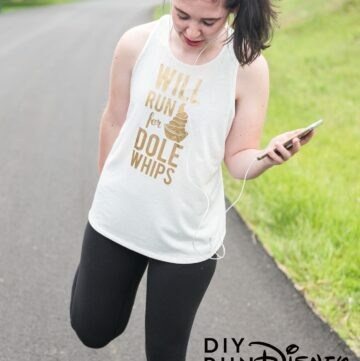 Even though I didn’t get all of the projects done that I wanted, I did manage to make some fun Disney Cruise shirts for us to wear. I was going to make everyone matching Disney family shirts but the kids vetoed that idea. They are almost 17, so I totally get it. Instead, I made them each a shirt that was more “unique” to them. I ended up making 3 different SVG Files for my projects. 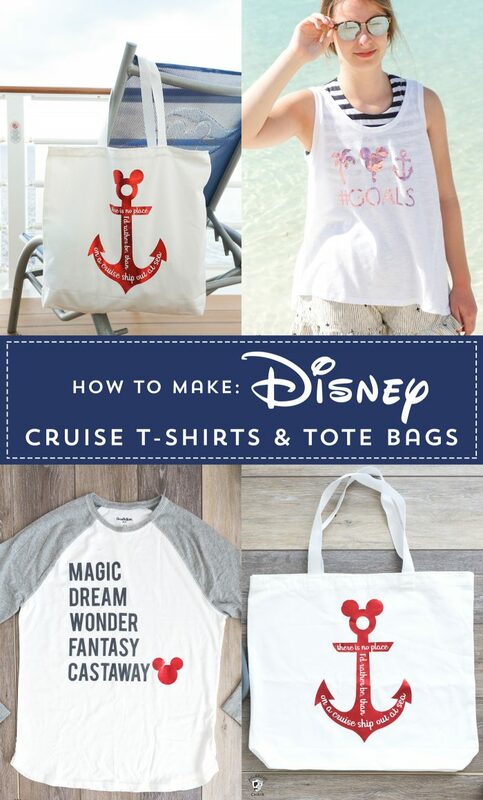 You can use any of the files to make Disney Family Shirts, Disney Tote bags, or even personalized baseball caps! 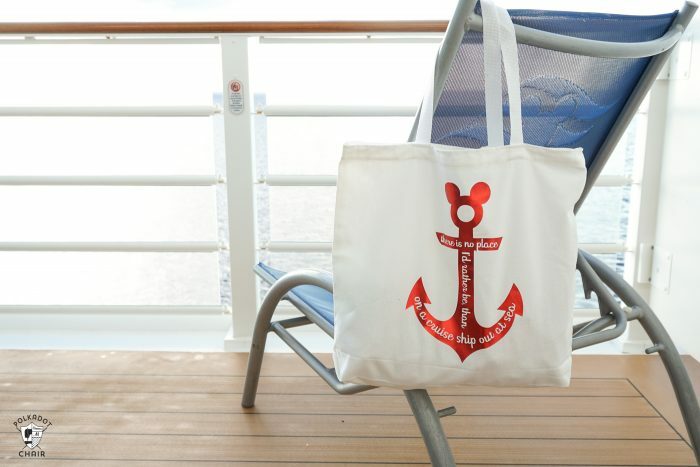 There was the Mickey Mouse Anchor “There is no place I’d rather be, than on a cruise ship out at sea”. Inspired by the lyrics to Hawaiian rollercoaster ride from Lilo and Stitch. 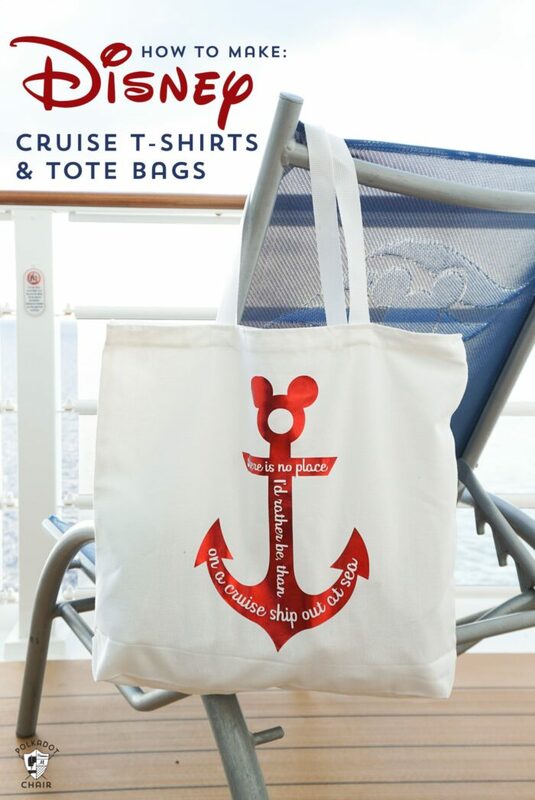 I decided to put that one on a simple white canvas bag to make a fun pool bag for me to use on the boat. 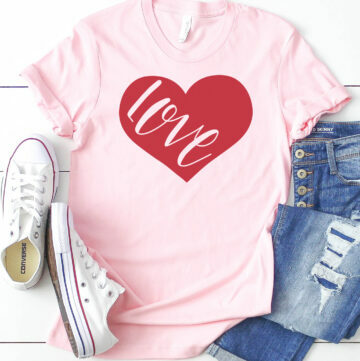 If you’d like to make something similar without the words, you can just “hide” them in the Cricut Design space and only cut out the anchor. 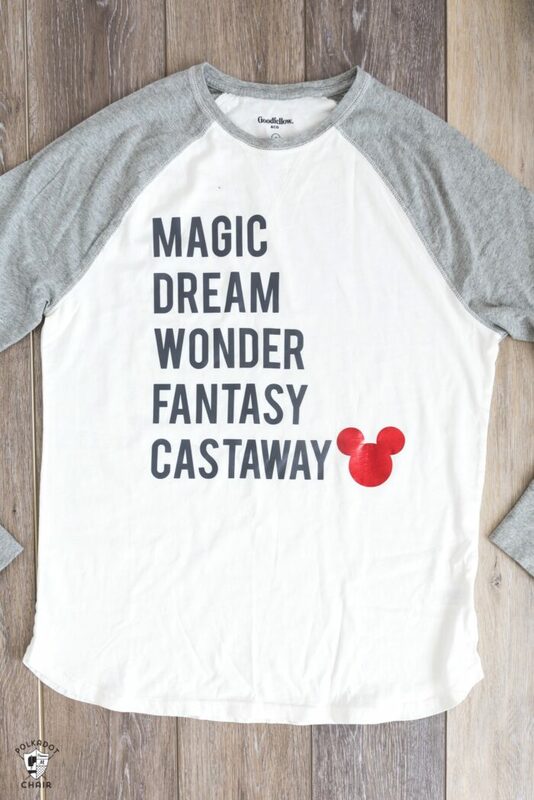 I also created a fun shirt that says “Magic Dream, Wonder, Fantasy & Castaway” inspired by all of the fun “places” on a Disney Cruise. I cut the Mickey head out of red foil iron on for a bit of pop and applied it to a baseball tee. 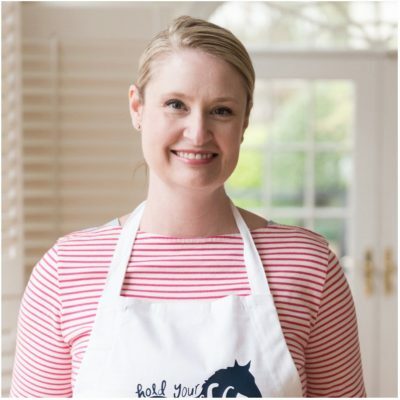 Even though we were going to a Caribbean destination I knew that it gets chilly on the boat and it would be a good idea to take along a long-sleeved shirt. 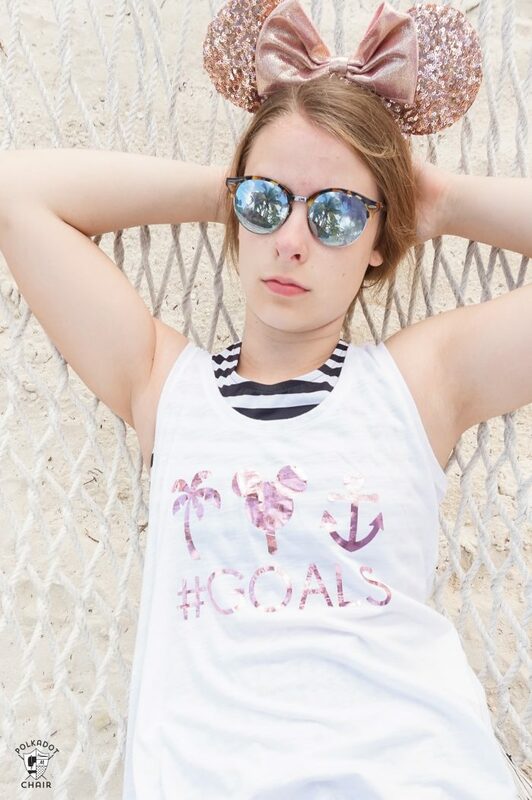 For my teenage daughter, I created a fun swing tank top that turned out to be the perfect little beach cover-up. I used a palm tree and anchor from the Cricut design library and created a fun Mickey ice cream pop using simple shapes in design space. This might be my favorite one of the bunch! 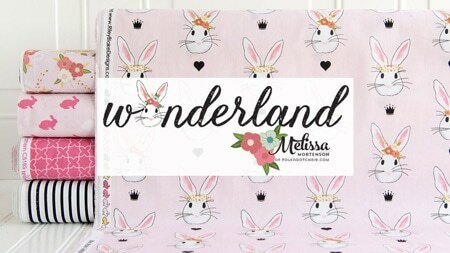 I created it in the pink foil iron on, which was a pretty close match to her rose gold Minnie ears! Grab the #Goals file in Cricut Design Space by clicking HERE. After the file pops up, click CUSTOMIZE at the bottom of the window. 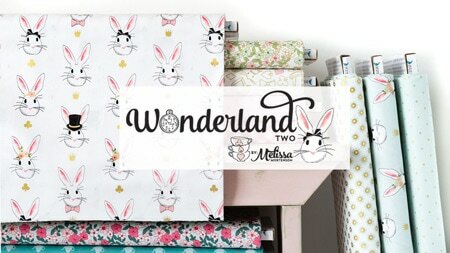 Download the SVG file to your computer and upload it into the Cricut Design space. Select all of the layers of the image and click ATTACH this will make it so that all of the pieces cut together in the correct shape. Otherwise, you’ll end up with a bunch of random cuts that you have to put together yourself. Depending on the image you may also need to “weld” some of the elements together. Use the WELD and ATTACH features as necessary to get the correct image. When you’ve sized to the size that you’d like, click MAKE IT, make sure it looks okay in the preview. Then click MIRROR for iron on, and send it to the machine. 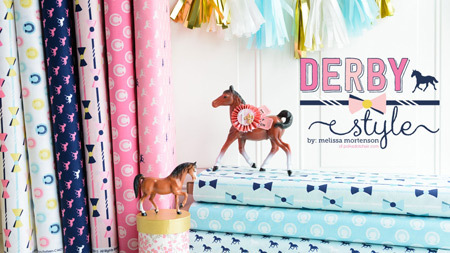 For a FULL tutorial on working with Cricut Iron-On Vinyl, you can CLICK HERE. You can use an iron. I have found however that my iron-on sticks better and holds up better after washing when I use a Cricut EasyPress. It has a timer and adjustable temperature controls. These features allow you to use precise measurements so that the iron-on is applied exactly as the manufacturer suggests. I also now use the Cricut EasyPress Mat. Most ironing boards absorb the heat of an iron, which is not what you want. You want the heat to stay on the iron-on. The mat is designed to do just that. 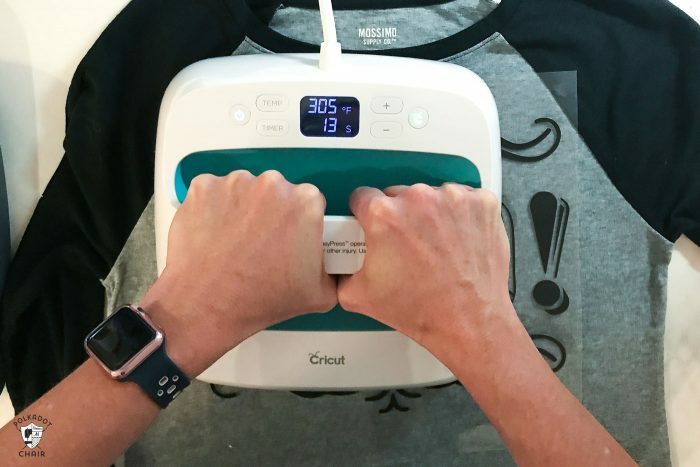 Plus it’s GREAT for t-shirts and tote bags since you can put it inside the shirt to get a more accurate press! I hope you enjoy these files! 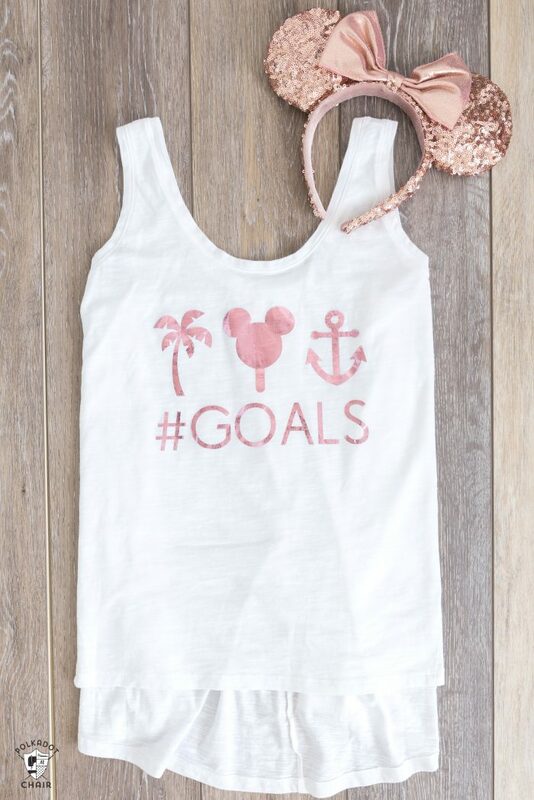 You could easily use the #GOALS one for a Disney ‘land’ vacation as well, just swap out the anchor for another image in the Cricut Design Space! 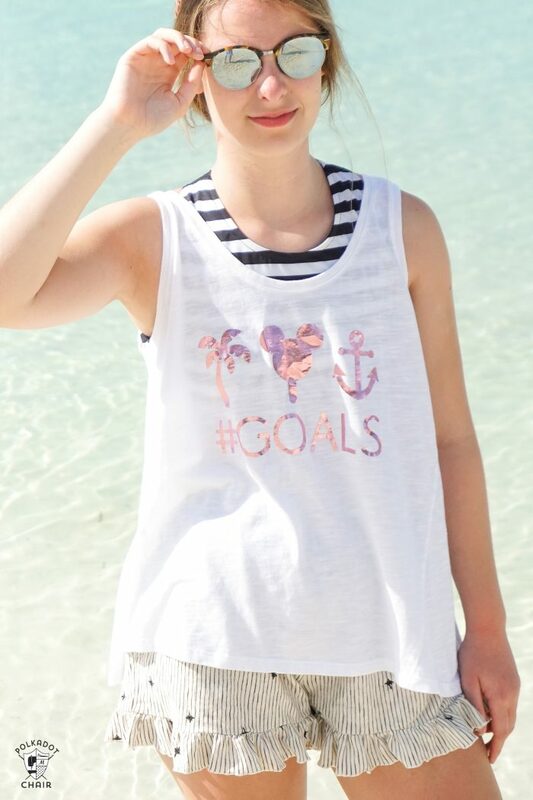 I would LOVE to make the #goals shirt but Cannot get the link to go anywhere….help please! I’ll get another file uploaded soon. 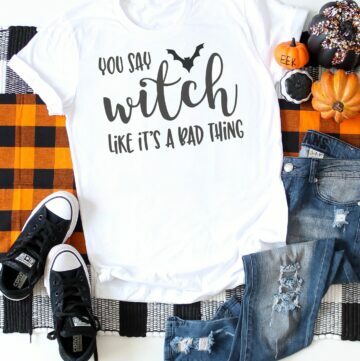 It looks like Cricut has changed a few things since I created this project. 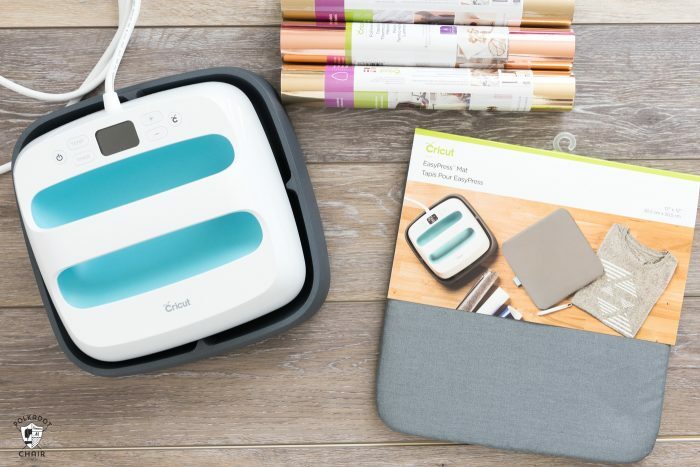 It opens in Cricut design space. 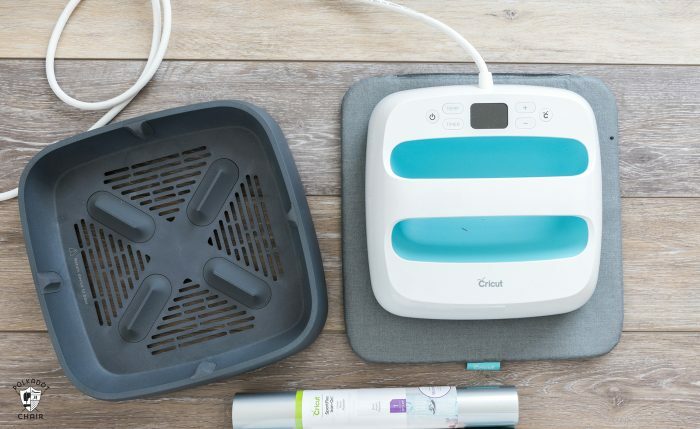 Do you have a Cricut account? Hi! 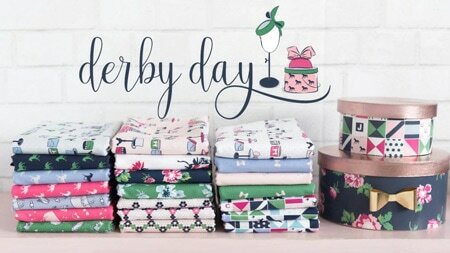 I am a brand new Cricut owner who is in love with your files! 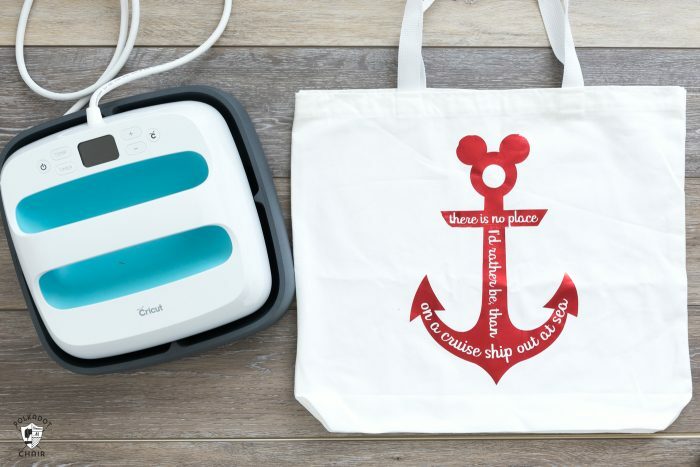 I’m trying to figure out how to cut your anchor on the cricut, but it keeps separating them in to 4 mats, and wants to print and THEN cut it 🙁 Do you have any tips that may help a novice out? Thank you! You need to select all of the elements you want to cut together and click ATTACH. This will tell the machine to cut it as one image. It defaults to trying to put everything on the mat in the most efficient way possible. Also make sure they are all the same color.